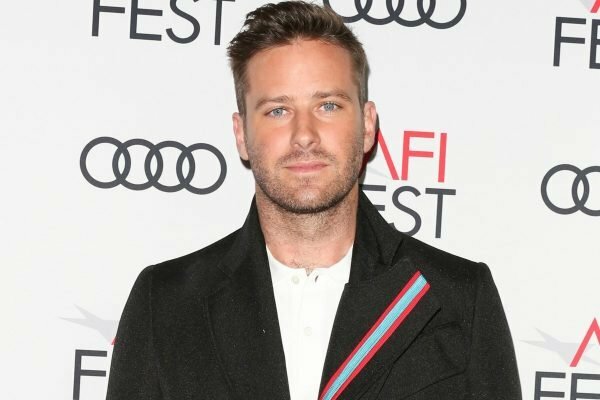 Armie Hammer criticised celebs for Stan Lee tributes. It's backfired on him. News in 5: Actor's criticism of Stan Lee tweets backfires; CNN sues Trump; Perth man's death sentence. 1. 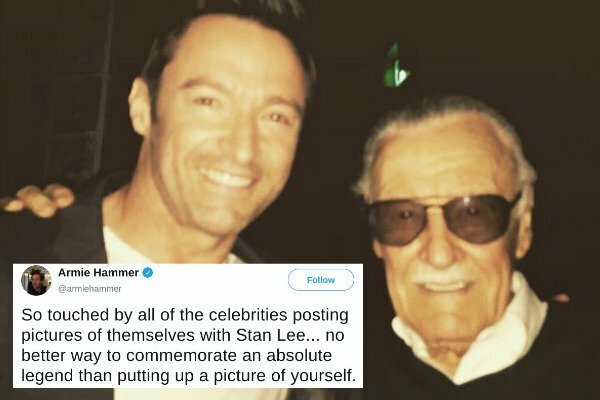 Armie Hammer criticised people for sharing photos of themselves with Stan Lee after his death, but it’s backfired on him. After news broke of Marvel chairman Stan Lee’s death at age 95, tributes from celebrities began to flood social media. Many of these tributes contained selfies or photos of the celebrities with Stan, and it was this trend that actor Armie Hammer took issue with. Hammer’s tweets have backfired as he has received criticism from thousands of fans. It’s weird because that’s what all the fans who ever met him at cons have been doing too, Armie. It’s almost like remembering a moment that they spent with someone who is now no longer with us gives people a small measure of comfort in their sadness. Assholes. So touched by your heartfelt response to the death of genius writer Stan Lee…no better way to commemorate an absolute legend than making things all about yourself as you make no sentimental gesture and instead mock how other people choose to grieve and/or honour an icon. Celebrities who posted photos of themselves with Lee as a tribute included Hugh Jackman, Paul McCartney, Dwayne ‘The Rock’ Johnson, Jessica Alba and Kat Dennings. Lee co-created many of the world’s most recognised comic book characters including Spider-Man, the Hulk, Black Widow, Iron Man and Thor. The creative dynamo who revolutionised comics by introducing human frailties in superheroes was declared dead on Monday at Cedars-Sinai Medical Centre in Los Angeles, according to Kirk Schenck, a lawyer for Lee’s daughter JC Lee. 2. CNN is suing the the Trump administration. CNN has filed a lawsuit against the Trump administration over the revocation of press credentials for White House correspondent Jim Acosta, whose questions and reporting have been a frequent target of criticism by President Donald Trump. "We have asked this court for an immediate restraining order requiring the pass be returned to Jim, and will seek permanent relief as part of this process," CNN said in a statement on Tuesday. Trump erupted into anger last week during a news conference when Acosta questioned him about the so-called migrant caravan travelling through Mexico and about an ongoing investigation into Russian meddling in the 2016 presidential election. "That&apos;s enough, that&apos;s enough," Trump said on Wednesday, as a White House intern attempted to take the microphone off Acosta. "You are a rude, terrible person." The White House suspended his credentials later that day, with press secretary Sarah Sanders accusing Acosta of putting his hands on the intern who was trying to take the microphone from him. She called his behavior "absolutely unacceptable". Video of the encounter showed Acosta pulling back as the intern moved to take the microphone. He called the White House accusations a lie. "While the suit is specific to CNN and Acosta, this could have happened to anyone," CNN said. 3. The cafe co-owned by the Bourke St terror attack victim is reopening. The floral tributes have gone from outside Melbourne&apos;s popular Pellegrini&apos;s Espresso Bar but the memory of co-owner and terror attack victim Sisto Malaspina lives on. Nursing homes and carers were invited to collect the piles of flowers overnight as the eatery gets back to business on Wednesday. A state funeral will be held for Mr Malaspina, 74, at Melbourne&apos;s St Patrick&apos;s Cathedral on Tuesday morning. He was killed in a knife attack launched by 30-year-old Hassan Khalif Shire Ali who drove a burning ute into the city on Friday. Shire Ali, whose passport was cancelled by authorities in 2015 amid concerns the Somali-born man would try to go to Syria to fight for Islamic State, was shot by police and died later in hospital. Two other men were injured. Tasmanian businessman Robert Patterson, 58, was released from hospital on Tuesday and a 24-year-old security guard went home on Monday. There is a condolence book available for people to sign at Melbourne Town Hall. Mr Malaspina&apos;s family has asked that in lieu of further flowers, donations be made to the Salvation Army. 4. An Australian man and his Thai wife have been sentenced to death for drugs. Luke Cook, 34, and wife Kanyarat Wechapitak, 40, were arrested at Bangkok&apos;s Suvarnabhumi airport last December and charged with attempting to smuggle half a tonne of crystal methamphetamine into Thailand and on to Australia in 2015. It&apos;s believed the smuggled crystal meth, also known as ice and with an estimated street value of $300 million, was dumped into the sea from a boat off the southeastern province of Chonburi after being spotted by authorities. About 50kg later washed ashore, police said. 5. Climate change risks an &apos;extinction effect&apos; that could annihilate all life on earth. The scenario is outlined in the journal Scientific Reports and describes how organisms die out because they depend on other doomed species in a process called co-extinctions.